Lawrence’s Public Schools Takeover Unconstitutional? The way the Massachusetts Law that allowed Education Commissioner Mitchell Chester to Takeover Lawrence’s Public Schools is being implemented could be Unconstitutional! According to this law, the Commissioner shall appoint a Receiver to a School District that has been declared chronically underperforming by the State Board of Elementary and Secondary Education; who would assume all the powers of Superintendent and School Committee and have full managerial and operational control over the school district. The state-appointed receiver is Mr. Jeffrey C. Riley. The problem, for now, is not Mr. Riley, who by the way is very qualified for the position and has a background in turning around difficult school districts. I only wish him the best and I pray for his success in Lawrence. My issue is with the process of How Mr. Riley came to be in Lawrence and how the Takeover is being implemented! We at The Valley Patriot knew from the beginning that Mayor Lantigua was not the initiator of this State Takeover as he so wanted and still wants everybody to believe! He keeps trying to make himself out as the bold and courageous genius who came up with the idea of inviting the State to Takeover Lawrence’s failing Public Schools. He mentioned it again in his State of the City Address given before the City Council on Tuesday February 28, 2012. But now that the cat is out of the bag, (so to speak), by the Eagle Tribune’s February 19, 2012 article entitled; “State, not Mayor, first on Schools takeover” by Keith Eddings, which verified what we already knew. Another point that the Valley Patriot knew which was in this same article was that the major contributing factor for the State to takeover Lawrence’s schools was not the 5 schools classified as underperforming which again Mayor Lantigua would have us believe. But rather the 81- page assessment by the Education Department that cited ineffective leadership by Mayor Lantigua and the former School Committee which resulted in the chronic underachievement by Lawrence Schools. 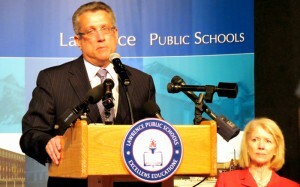 The Mayor and the former School Committee failed to hire a Superintendent after firing Dr. Laboy. Instead of providing leadership or direction for the school district, all they provided was a circus atmosphere by fighting among themselves for the entire two year term! Also it seems that the State’s Education Commissioner Mitchell Chester wasn’t so forthcoming with his public statements as well. He said many times prior to the Takeover that he was having positive productive conversations with the Mayor of Lawrence and that the option of a State takeover was just one of many being considered. It looks like to me that the Commissioner went along with Mayor Lantigua’s boastful story of taking full credit for the decision of requesting the State to take over the LPS. He allowed this public abuse of trust knowing full well plans were being made for a state takeover a month prior to the Mayor’s announcement of his decision. What was he thinking? This brings me to why I am not convinced that the implementation of this takeover by the State is Constitutional. The issue I have with this State Takeover is that it took place without one single vote by an Elected Official in Lawrence. In addition, we are being told that this State Takeover makes the School Committee that we, the citizens of Lawrence just elected to represent us void! Reading through the legislation I have not found any language that clearly stipulates that the School Committee that was elected by the people of Lawrence is dismantled or dissolved in any way shape or form. Nowhere is it expressed that the School Committee is without its oversight authority or its responsibility to represent the city districts that elected them. Just because Commissioner Chester and Mr. Riley say it does, does not make it so! This action in my opinion forwards too much power and authority to just one man and as the old saying from Lord Acton goes, “power tends to corrupt, and absolute power corrupts absolutely….” We in Lawrence have been down this road before, having one individual with too much power and authority. The law does state however that the receiver is to report directly to Commissioner Chester, which leaves us without representation. Thankfully, Mr. Riley has made the decision to include the newly elected School Committee members in his turnaround plan and utilize them in a very limited capacity as Ambassadors representing the City Districts that elected them. But Mr. Riley has made it very clear that he is not obligated to include them in any decisions concerning the day to day operation of the school district. A very important point that must be remembered is that both Mr. Chester and Mr. Riley are appointed individuals and are not elected officials; therefore they are not accountable to the citizens of the Commonwealth. They only need to report and answer to the individual that appointed them. Furthermore included in this law is the establishment of a local stakeholder group of not more than 13 individuals for the purpose of soliciting recommendations on the content of a turnaround plan to maximize academic achievement of students. This is good for academic improvements but delivers no financial accountability to the taxpayers! The way that this state law is being implemented wipes out Lawrence’s City Charter which gives the School Committee the responsibility of the management of the public schools of the city. This state law also takes away our right to equal protection under the law as stated in the 14th Amendment of the Constitution of the United States, which states that no State shall make or enforce any law which shall abridge the privileges or immunities of the citizens of the United States; nor shall any state deprive any person of life, liberty, or property, without due process of law; nor deny to any person within its jurisdiction the equal protection of the laws. Our right as citizens of Lawrence to have a Superintendent of Schools over our children accountable to us has been removed by an appointed individual without our consent! To put it bluntly, we are being shut out! The school administration has been instructed by the Commissioner and the Superintendent to stop forwarding any financial reports or school safety incident information to the elected School Committee members. Therefore, in my humbled opinion this Takeover of the Lawrence’s Public Schools by the State is in direct violation of the Constitution of the United States of America! To be continued…..